Time To Practice Piano: How Much Time Should I Practice? How much do you need to practice piano? Here are helpful recommendations for the minimum time needed of practice to make a steady progress from a young child to adult. What are good piano keyboards for beginners? Here are tips and advice on what to look for in an instrument that suits your needs. Free beginner piano lessons! Learn the first steps to play the piano right here. No previous skills needed. By starting to play by ear, your playing will sound great at once. Let’s play! Learn music theory to improve your piano playing! Before you groan and think; "that's boring", hear me out a little: Even learning just a teeny nugget of music theory will improve your playing. By understanding what a music scale is, for example, you will be able to find scales in your pieces and know not only how to play them, but why there are half steps here and whole steps there, and why some need accidentals and some don't. 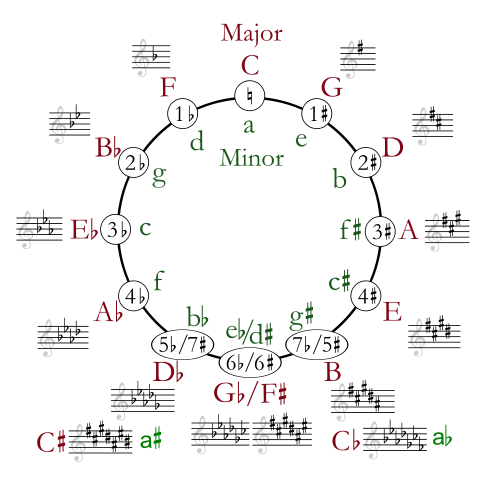 You might even be tickled realizing that a particular piece uses a natural minor scale pattern, (which is not so common) or a melodic minor scale. Or perhaps you will finally "see" the chords in a piano piece, and discover the chord progression that they follow (perhaps the same as in a piece of a different style), in this way learning the piece much easier as well as memorizing it quicker. Knowing a little bit about key signatures will make it easier to understand why some notes are raised or lowered and others not. It will also become so much more interesting to discover when the composer changes the key signature, or the accidentals of the piece and takes the listener/performer to entirely new directions. It can be fun to discover the composers own sometimes "private" jokes in a piece, just by understanding that the note or chord we would expect to finish the piece- doesn't. Knowing even a little bit of the underlying building blocks of music, music theory, will open doors to much deeper and interesting things to ponder as you learn your piano piece. And, yes- of course it will deepen the appreciation of a piece, make it easier to learn, and being more fun doing so. Who knows- maybe you'll try your hand at starting to write your own music?